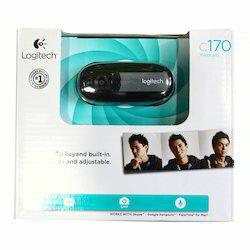 Our range of products include logitech c170 web camera. Logitech® Webcam C170. The easy way to start video calling and send photos (5MP). With simple plug-and-play setup, you’ll be making video calls in exceptional VGA resolution in no time on Logitech Vid™ HD. You can take and send beautiful, high-resolution photos at up to 5MP (software enhanced), too. A built-in noise-reducing mic helps loved ones hear you clearly on calls. You can also record lively, colourful videos in XVGA (1024 x 768) resolution and share them with friends, family and the world. Also, the universal clip makes it easy to use with your desktop or laptop.